Kayak Canoe Transport Cart Dolly Condition : Brand New Capacity : 150 LBS Very sturdy boating dolly capable of hauling your kayak, canoe, or boat up to 150lbs. Its solid metal frame is implemented with foam bumpers on each arm to protect your vessel. It comes with a 12 ft. tie-down strap that securely fastens your vessel to the dolly, and 2 very sturdy double-leg kickstands that allow for easy loading. Outfitted with 2 large pneumatic tires, you are able to cart your vessels through a variety of rough surfaces including sand and heavy gravel. The support stand features a 9-1/4"H spring-loaded stand which keeps the dolly cart propped for quick onshore loading out of water. When not in use, the dolly easily folds together for storage. Designed to carry a canoe/kayak by the hull in a V-shaped cradle, and securely fastens with sturdy nylon straps. Stop hauling your vessel by dragging it around on damaging surfaces. With this dolly you are able to focus on what is really important, getting into the water hassle free. Material : solid metal frame, Aluminium pipe (20 x2mm) Tire size: Large(9-1/2"D) pneumatic tires (3-1/2" wide) Quick and easy assembly! 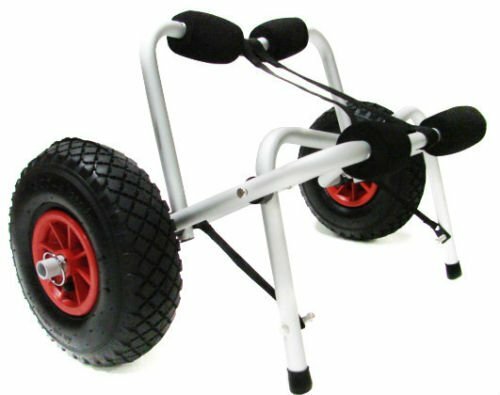 ✿ Very sturdy boating dolly capable of hauling your kayak, canoe, or boat up to 150lbs. Its solid metal frame is implemented with foam bumpers on each arm to protect your vessel. ● The support stand features a 9-1/4"H spring-loaded stand which keeps the dolly cart propped for quick onshore loading out of water. When not in use, the dolly easily folds together for storage. ✿ It comes with a 12 ft. tie-down strap that securely fastens your vessel to the dolly, and 2 very sturdy double-leg kickstands that allow for easy loading. Outfitted with 2 large pneumatic tires, you are able to cart your vessels through a variety of rough surfaces including sand and heavy gravel. ✿ Designed to carry a canoe/kayak by the hull in a V-shaped cradle, and securely fastens with sturdy nylon straps. ● Stop hauling your vessel by dragging it around on damaging surfaces. ● With this dolly you are able to focus on what is really important, getting into the water hassle free. ✿ Material : solid metal frame, Aluminium pipe (20 x2mm) ● Tire size: Large(9-1/2"D) pneumatic tires (3-1/2" wide) ● Capacity : 150 LBS ● Quick and easy assembly! If you have any questions about this product by New Kayak, contact us by completing and submitting the form below. If you are looking for a specif part number, please include it with your message.